NSUI demanded re-election with paper ballot while the EC said the EVMs used were not provided by it. 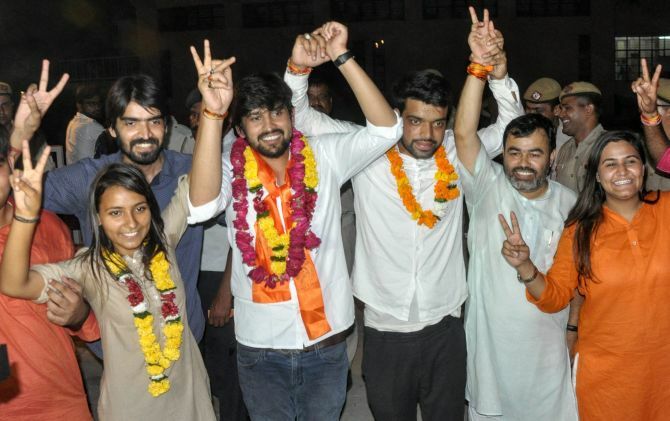 The Akhil Bharatiya Vidyarthi Parishad, the student wing of the Rashtriya Swayamsewak Sangh, on Thursday bagged three posts, including that of the president, in the Delhi University Students' Union elections. The Congress-backed National Students Union of India won only one seat, while the Aam Aadmi Party’s student wing Chhatra Yuva Sangharsh Samiti which fought the elections in alliance with Left-backed All India Students Association failed to open its account. ABVP's Ankiv Basoya won the presidential post with a margin of 1,744 votes while party's candidate Shakti Singh was declared as the vice president after he won with a margin of 7,673 votes. NSUI's Akash Choudhary won the secretary's post while ABVP's Jyoti emerged victorious on the joint secretary post. Basoya got 20,467 votes while his rival NSUI's Sunny Chhillar got 18,723 votes. Singh received 23,046 votes against NSUI rival Leena's 15,373 votes. The AISA and the CYSS presidential candidate Abhigyan got 8,019 votes. Their vice-presidential candidate Anshika Singh, a student of Dyal Singh College, got 7,335 votes. The alliance's candidate for the post of secretary, Chandramani Dev, a student of Law Centre-II, got 452 votes, while 6,810 students selected NOTA in the election for the post. Sunny Tanwar, a student of PGDAV College, who contested for the post of joint secretary secured 9,199 votes. Choudhary, the lone winning candidate of the NSUI, alleged that fair elections were not conducted and data of seven EVMs were missing. The Chief Electoral Officer in Delhi on Thursday clarified that the EVMs used in DUSU elections have not been issued by the Election Commission and it seems to have been procured privately. The counting had to be suspended for few hours following glitch in the EVMs but was resumed in the evening amid heavy police deployment. The NSUI demanded fresh polling, while the ABVP demanded resumption of counting. "There are only 8 candidates so how is it possible that votes were cast to a 10th candidate? All machines were fine yesterday. Police and administration are involved in this," Fairoz Khan, NSUI president, alleged. Later, all candidates came to an agreement on resumption of counting. Celebrations broke out with bursting of crackers and loud cheering at the Kingsway camp counting venue as the results were announced. The supporters lifted the victorious candidates on their shoulders and posed for photos flashing the 'victory' sign. While the battle for DUSU has mainly been the contest between the NSUI and the ABVP for years, the Left-affiliated AISA and Aam Aadmi Party's CYSS entered into an alliance and also vied for the central panel posts this time. Amid heavy police presence and some last-minute wooing of voters, DUSU polls were held on Wednesday with a voter turnout of 44.46 per cent. Polling took place at 52 centres in the colleges. There were as many as 23 candidates in the fray. DUSU is the representative body of the students from most colleges and faculties. Apart from DUSU, which is an umbrella council, each college also has its own students union for which they hold separate elections. Though Delhi University officially does not recognise any political outfit, students who contest the polls are backed by different parties. The polls have been keenly contested over decades and are seen as a stepping stone to mainstream politics. The Congress on Friday once again alleged tampering with the EVMs used in the polls and demanded that the election be held again with paper ballots and the counting of votes under CCTV surveillance. Delhi Congress chief Ajay Maken said the party was also considering the legal options to get the polls countermanded. "Our main demand is that the Delhi University students' council polls be held again using ballot papers and the vote counting under CCTV surveillance," he told a press meet. "We are examining all the aspects of moving the court," Maken said, when asked whether the Congress would seek legal recourse after the NSUI's defeat in the DUSU polls. "The data of at least seven EVMs is missing. This is the first time vote counting was postponed in the DU polls," she said, adding that the NSUI had done real good work in the university. The Election Commission, meanwhile, said on Friday that the EVMs were not provided by it. It also said the EVMs used by it for Lok Sabha and assembly polls were different from the ones used in the university students' elections. The Election Commission said in a statement that confusion existed in minds of many people about the jurisdiction of the ECI. "...ECI is not responsible for the conduct of local body elections (municipalities, panchayats) that are conducted by the state election commissions and elections held by various organisations/institutions in the country and consequently about various protocols and procedures adopted by them," it said. The commission said in the statement that it has a firm conviction about the integrity, non-tamperability and credibility of 'ECI-EVMs'. "The basis of confidence of the commission flows from a wide range of technical and administrative protocols and procedural safeguards that protect our EVMs and VVPATs against any sort of tampering during manufacture, transportation, storage, polling and counting process," it said.